The 36-Hour Day | Work It, Mom! Our home-based businesses are becoming busier every day, and it has become necessary for me to purge and organize the home office. I can’t work amid clutter. The closet had become a dumping ground for all kinds of things that didn’t have a place elsewhere in our home. I had old office supplies that I no longer used, piles of papers to sort through, and a lot of items I had been holding onto to sell, but hadn’t got around to. Organizing our homes office so that is efficient for two home-based businesses turned out to be a bigger task than I had anticipated. I recently sat down with Laura Watts, a professional organizer and operator of her own home-based business, Double Take Organizing, and listened as she shared her tips for getting the home office organized and how to keep it that way. Here are five of my favourite tips that Laura provided for organizing the home office. 1. Paper is the cause of a lot of disorganization in a home office. 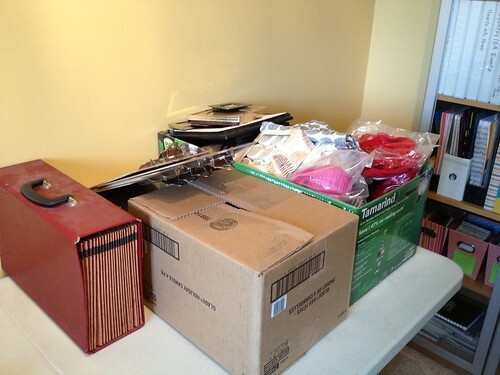 Laura recommended that to help eliminate clutter from paper, touch a piece of paper only once! That means that if you print something, file it. If you write a list, refer to it as soon as you can and discard it when you’ve completed the tasks on it. There are a ton of electronic tools and apps available to help you manage a paper problem or eliminate its use. 2. Magnetize with paint. This idea has me totally captivated! I love a magnetic surface for getting things up off my desk. 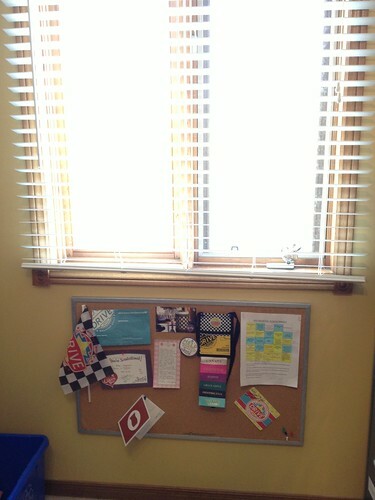 I especially like magnetic clips that will hold bunches of coupons, photographs, paint chips or kids’ artwork, and being able to put these up on a magnetic wall surface sounds like a terrific way to organize the home office. Further tips for using magnetized paint can be found here. 3. Use a business card capture app such as Abbyy. A few years ago I tried out a business card capture app for my iphone but I wasn’t happy with the results. The technology just hadn’t advanced to the point where the data capture was accurate. Abbyy is a great app that is very accurate and totally worth the $4.99 I paid for it if it means my data won’t get lost and I can maintain up-to-date, accurate records of my business contacts. 4. Ask yourself if you’ve used the item in the last year. There comes a time in every home office organization project when purging becomes necessary. To ease the difficulty of eliminating extra clutter from the home office, get rid of stuff! Give it away, donate it to shops such as Salvation Army or Value Vilage, or throw it in the garbage. I usually have to wait until the right mood strikes me to do this, but when it does, look out! I had five garbage bags of stuff picked up last week and another five will be picked up next week. It feels good. Another pile ready for donation. Get out of my house! 5. Go vertical. The amount of wall space in my office that is left blank is dwindling. Almost every wall has either a shelving unit of some kind, a bracket or basket for holding files and documents that I can’t throw away. When you run out of space to actually work at your desk, go up! Even this space beneath my office window is being used to help me stay organized. No space is wasted! What is your favourite method for organizing the home office? We are deep in the midst of summer. Nate spent last week at home with me while his daycare provider took a week off, and it was pretty great to be home, just the two of us, together every day. It was also challenging in some ways. Because I work from home and Nate goes to daycare during the day, I am usually able to get all of the various errands, housework and other domestic tasks done that need to get done, as well as the work that I need to accomplish. Having a busy three and a half-year old at home last week made this juggle a bit tricky. I’m not sure I finished any task from start to finish. The kitchen remained a disaster area for a full week! It seemed like every time I finished cleaning up after one meal, it was time to mess the kitchen up with another. I got to thinking about some of the ways I could save time in the kitchen during the summer months, and I’ve come up with this list of five of my favorite summer kitchen time savers for busy moms. 1. Put together a snack basket to keep in the pantry. A friend of mine recommended this idea several months ago and I’ve decided to implement it. Use baggies to put together a bunch of different kid-friendly snacks such as trail mix, goldfish crackers, raisins or cookies. Keep the snacks in the cupboard at a height the kids can reach. When they ask for a snack, instead of struggling to find something appropriate in the pantry, allow the kids to choose one of the snacks from the basket. 2. Keep vegetables cut up in the fridge. They can be used as a side dish with some meals, ingredients for a salad, a snack for kids or in our case, or for taking a packed lunch to work. 3. Keep a box of wine in the fridge. I’m totally serious. It takes up less space because it’s tall and you don’t have to worry about using a cork screw to open wine at dinnertime. Pouring a glass of wine takes only a few seconds when the box is ready to go in the fridge, and it’s always on hand for summertime guests who pop over. 4. Take an hour on a Sunday afternoon to plan out the week’s meals. Shop accordingly. 5. When the weather is hot, forget about turning on the stove. Plan a deli night. Pick up some crusty buns, deli meats, potato salad and dill pickles. 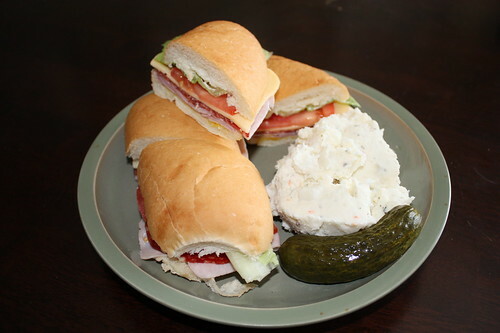 Everyone can make his or her own sandwich and fill up on a cool dinner that is just perfect for summer. What are some of the ways you save time in the kitchen during the summertime, when the kids are underfoot? About a month ago, I experienced an annoying pain in my left calf as I settled myself down to bed for the night. The pain felt like a Charlie horse, except it was located in one very specific small spot, and it lasted about an hour. Fortunately, it went away and I was able to get to sleep, but it worried me for a few days. There is a history of DVT (deep vein thrombosis) blood clots in my family and so I am familiar with the symptoms, which include a Charlie horse-like sudden pain in the calf. People who live a sedentary lifestyle or sit for long periods of time are more likely to suffer from blood clots (“On the Alert for Deep-Vein Blood Clots”—Harvard Health Publications). I do consider myself to be an active person; I’m always running around doing errands, gardening, cleaning the house, or using the elliptical machine in our basement. However, I do spend a lot of time during the day sitting at a desk. When I worked full-time in “cubicle land” I would find all kinds of excuses to get up from my desk and take a little walk around the floor where I worked. I’d grab a coffee, go to the bathroom, or find someone I needed to talk to…anything to get me out of that cubicle. Sometimes I forget that even though I work from home now, I should still get up from my desk every now and then to get moving and stay active. In no particular order, I’ve come up with a list of ten of the activities I most like to do when I need to get up and away from my home office desk in an effort to prevent health problems such as DVT. Each task takes 15 minutes or less and gets my legs moving! 1. Head down to the porch to deadhead and water my flowers. 2. Take a walk to the mailbox around the corner to retrieve the mail. 3. Take the neighbour’s dog for a walk around the block. 4. Collect the laundry from around the house and throw on a load. Better yet, take the clothes from the washer and hang them out on the clothesline. 5. Empty and/or load the dishwasher. 6. Run up and down the stairs a few times. 7. Vacuum one level of the house. 9. Take a photo walk around the neighbourhood. 10. Pull weeds until one bucket is full. If you work from home, what do you do to get yourself away from your desk every once in awhile? My home office is not something I would ever consider beautiful. I guess that’s why I love to imagine a beautiful and organized place for me to work in at home. I do hope to remedy this situation soon, giving my home office a bit of a face lift this summer. Because we only have one child, our three-bedroom home has a room that is devoted to work. Unfortunately, that room is also devoted to piles of…stuff. As I write, there is a pile of books on the floor that is destined for either donation or the trash. There is a box of newly-delivered business supplies in the other corner, and my recycling bin is overflowing. The vacuum cleaner has also mysteriously appeared against one wall. 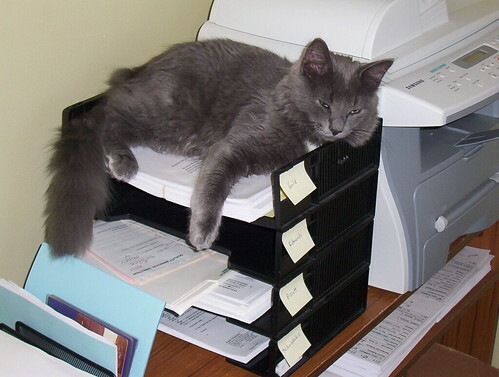 I do make efforts to keep the home office organized. I have a filing cabinet, a book case, and a pair of shelves on the wall above my desk with bins and baskets for pens, post-it notes and other office supplies, but the arrangement of them is far from pretty. Like recipes, I also collect photographs of beautiful home offices. And like all social media junkies, the place I turn to for inspiration is Pinterest. I have a board on Pinterest called Home Office Inspiration where I’ve gathered photos of some prettily organized home office spaces from which to draw inspiration for fixing up my home office space. I looked at my Home Office Inspiration collection to figure out what I like best about these home offices and what needs to be done to bring mine up to snuff. 1. Natural light. My office does have a big window that faces northeast. The light in the morning is particularly lovely. All I need to do to fix up the window in the home office is to put up some curtains or another pretty window dressing. 2. Open shelving for office supplies, books and files. I do have open shelving already so they just need to be fixed up and more efficiently organized. 3. Decorative accessories and artwork. This is an area I am lacking in. My home office is functional but not stylish. 4. A soothing color on the walls. Yikes. The walls in this room are a shade of yellow called “corn muffin” or something similar. It is not a soothing color. So it seems like my first step in fixing up the home office should be to paint. 5. A simple desk surface on which to work. I’ve got a large, simple surface to work on…we picked up this IKEA desk years ago and it has worked really well ever since. I don’t need to buy any new furniture. Is your home office setup working well for you? Is it a place you enjoy working in? Last fall and winter I had the pleasure of teaching a class at the local community college on a topic that is near and dear to my heart: social media. As part of the course, my students and I spent some time discussing the merits of crowdsourcing. I had them do a little bit of research and come up with examples of how businesses use crowdsourcing to solve problems. Not sure what crowdsourcing is? I bet you’ve encountered it, even if you didn’t realize it at the time. Crowdsourcing is distributed problem solving. By distributing tasks to a large group of people, you are able to mine collective intelligence, assess quality and process work in parallel. Many writers and bloggers use social media as a tool for crowdsourcing ideas, facts, quotes and examples for the purpose of writing blog posts or articles. I’ve done it. In fact, I used crowdsourcing for my post right here on Work it, Mom called “Shift Work for Beginners.” I wanted to talk to other parents who were more experienced with shift work so I distributed the task of collecting information about shift work to my Twitter followers, mining their collective intelligence on the topic to generate some content within my article. It used to annoy me when I saw writers using this method to collect information, only to present it as their own in a post or article later on. I think I felt a bit betrayed. I don’t mind crowdsourcing posts much anymore, because it’s easy for me to identify them. Crowdsourcing becomes a problem for bloggers when their followers begin to feel that the engagement is no longer sincere, and exists only for content generation. All of this got me thinking about the ways in which crowdsourcing can be done well, along with the ways it is sometimes done poorly. 1. Divulge to your audience or community that you’re fact-hunting or looking for a quote on a particular topic for an article or post that you’re writing. 2. Credit the source in your article, having gained permission for the quotation ahead of time. Link to the Twitter account or blog URL of the person who provided you with the quote. 3. Engage all of the members of your audience or crowd when it comes to the answers you receive (this is the social web, after all). It’s rude to ask a question in a room filled with people but only acknowledge the funniest, most witty or most interesting people present, isn’t it? The same is true when crowdsourcing. Thank others for contributing to the discussion or at least acknowledge their responses. 1. Never present the ideas of others as your own. This is called plagiarism. Professional adults do not engage in plagiarism and there is no excuse for taking someone else’s thoughts or ideas and passing them off as your own. 2. Don’t constantly rely on your crowd for developing your content. Presumably, your community has been following your writing because they value your original thoughts. Keep it that way. 3. Don’t wait until the last minute to engage in crowdsourcing. Doing so will ensure you won’t have enough time to properly credit your sources. Do you use crowdsourcing for your writing? Do you have any “do’s” or “don’ts” to add to this list? Last week I experienced what can only be described as the shock of having my cell phone stolen. Or so I’d thought. (More on that later.) In that hour or so of panic, I learned some valuable lessons about what to do if your cell phone is, indeed stolen. I was doing errands on a beautiful, warm afternoon, and I pulled into a small plaza to pop into a discount dollar store to pick up a couple of gift bags. I left the windows down in my truck about three inches, grabbed my purse, leaving my phone in the center console, and locked the doors behind me. I went into the dollar store, went directly to the gift bag aisle and retrieved what I needed, paying the cashier before returning to the truck. I was in the store a total of about two or three minutes. I settled myself back into the driver’s seat and reached for my phone. My phone wasn’t where I’d left it. I rummaged hastily through my bag, and the phone wasn’t there, either. I checked between the seats. I checked under the seats. I checked under the truck. I asked several people if they’d seen anyone reach into the truck. A kind man on the sidewalk offered to call my phone for me and I accepted. Nothing happened. I could only assume that someone had watched me leave the truck and was now nearby hiding somewhere, looking at my list of contacts, my photographs, reading my Facebook feed, making long distance calls…I wanted to cry. I left a business card with the dollar store owner in the rare event the phone turned up, and left. I felt lost. I had many emotions during that drive to meet my mom: sadness, anger, embarrassment, confusion…I cried. I was so angry at myself for leaving the phone in the truck in the first place, for being trusting and naive, for thinking that I could leave something valuable in the vehicle twenty feet away from where I was shopping without it being stolen. I imagined having to tell my husband what had happened and how we’d have to go out of pocket for a new phone. When I met up with my mom, the friend that was with her called my cell phone. I didn’t hold my breath. Then, miraculously, someone answered. The plaza where I’d been shopping also had a bank and the person who answered my phone was a bank teller. Someone had picked up my phone off the ground and brought it in. I guess my phone hadn’t been in the console, after all. I had somehow managed to drop it on the ground without realizing it and in the brief time I was in the dollar store, it had been returned. My faith in humanity restored, I went back across town to retrieve the phone from the bank teller. Is there a moral to this story? Yes, I think there is a whole discussion we could have about when to have faith in your fellow citizens instead of assuming the worst. There is a discussion to be had about where cell phones belong in a vehicle (safely stowed in a bag, for example). There is also a discussion to be had about what to do when your cell phone is stolen. This experience taught me that some of the things you can and should do after your phone is stolen or lost. 1. Report the loss/theft to your service provider. My provider’s policy, for example, is to suspend the phone and block it from further use so that the owner isn’t liable for the costs associated with usage by the individual who stole it. 2. Change the passwords on your bank accounts and social media applications to prevent someone else from logging into them from your device. 1. Set the password/lock feature to the highest level possible. My phone is now set to lock, requiring the password, after one minute of inactivity rather than five minutes. After all, I thought it had only taken a couple of minutes for the phone to be lifted from my truck, and in that time the phone would not have become locked. 2. Activate “Find My iPhone” if you’re using an iPhone or install another app that will use the GPS to help track down the location of your lost or stolen phone. 3. Pick a spot to keep your phone when you’re on the go and consistently stick with it. I’m seriously thinking about picking up a belt clip for my phone and making a habit of keeping it there! Have you ever had your phone lost or stolen? How did you handle it? The road to becoming a successful meal planner is paved with good intentions, isn’t it? I’m a chronic recipe collector. On a daily basis, I tear recipes out of magazines, pin recipes to the personal Pinterest board I call “Yumminess,” I print recipes from websites and stash them into a binder, I borrow cookbooks from friends and neighbours and post ideas for delicious dinners to my blog’s Facebook page. Does all of this make me a successful meal planner? You’d think it would, but no, it does not. It makes me a chronic recipe collector. This summer I’m determined to be a better meal planner. Planning meals makes life so much less stressful, and for busy working mothers, it can be a life saver during the time of day that is usually so rushed and when so many demands are being made by members of the family. Standing in front of the refrigerator trying to figure out what to make for dinner drives me crazy, and avoiding that craziness is what prompts me to do meal planning. I want to go from recipe collector to meal planner! You can do meal planning on as small or grand a scale as you’re comfortable with. When I do meal planning, sometimes I only plan a week in advance, and leave out the weekends, assuming we will do takeout one night and leftovers another. Other times I’ve done a whole month in advance, plotting each meal on a dry erase calendar, using my recipe collection as inspiration. Regardless of the scale upon which you decide to plan meals for your family, here are five quick steps for making your dream of becoming a meal planner into reality. Collect recipes. (See my habit, described above.) Make it a habit to grab recipes or dinner ideas you think your family will enjoy wherever and whenever you see them. If your kids are old enough, get them into recipe collecting too, and engage them in choosing healthy meals they’ll actually eat. Pick a day to make meal planning your task. I use Sunday afternoons or evenings, usually, to sit down with a sheet of paper and plot out five meals I want to make over the coming week. Plan your grocery list around the meals you have planned. For example, if I know I’m going to make spaghetti and meatballs on Wednesday night, I’ll see if all of the ingredients I need are on hand. Whatever isn’t in the pantry, fridge or freezer goes on the grocery list. Post your meal plan somewhere prominent in your kitchen so you’ll easily remember each morning if there’s something you need to defrost or if you need to carve out some afternoon time to prepare the meal. Mine often gets clipped to the front of the fridge, but I’ve used a dry erase board, too. Try to stick to the plan, but if for some reason, you can’t don’t sweat it. Meal planning is meant to make life less stressful. 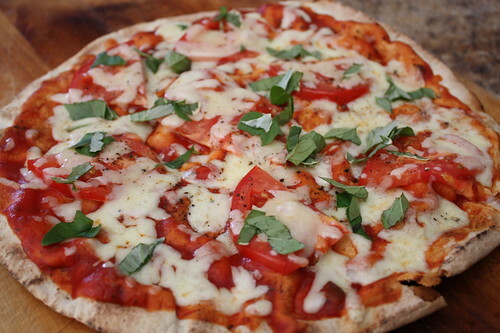 Swap out a meal for another night or give yourself permission to call for pizza if you run out of time. What are your favorite sites for recipe hunting? What tips do you have for integrating meal planning into your life? My husband and I are partners in a seasonal business that got underway for the year just this past week. Between that and our other means of earning a living, by the time Friday arrived, our week was officially a couple of hours short. On Friday while he was on his way home from work, Graham sent me the usual text message. Later that evening after I’d managed to scrape something together for supper, my plans to hit the local grocery store foiled, Graham suggested I do a little research into the possibility of having our groceries delivered. I couldn’t get to the computer fast enough. I was delighted to discover that there was, indeed, a grocery delivery service in our area and they would even accept payment at the door. No credit card required! As much as I wanted to save time, I wasn’t willing to pay interest on our weekly food bill. I put in an experimental order, arranged a delivery time and presto, the very next morning our groceries were dropped off, all packed up beautifully. All I had to do was pay and put them away. It was beautiful. I started to wonder what other services I could use to save time, essentially adding hours to my week. As I gushed on Twitter about my newfound love for grocery delivery, friends online revealed they have shirts cleaned so they don’t have to iron them. Others proclaimed their undying love for their cleaning ladies. One person even admitted to ordering tampons and paper towels for delivery to avoid multiple errands in a busy city. As for my family and I, we will be having our groceries delivered for the next little while. I’m giving us the gift of time, for a small delivery fee that is totally worth the cost. What services do you make use of to save time and energy? The morning started off like many others. Nate wandered into our bedroom in the grey light of morning and climbed into bed with me. We snuggled together for half an hour or so before we decided it was time to go downstairs and settle in on the couch for coffee and cartoons. He felt a little bit warm to me, but we had just been in bed where I had found it to be a bit warm under the weight of the duvet with Nate’s little body snuggled up with mine. He didn’t seem hungry and because he wasn’t acting himself, I avoided giving him milk, opting for a bit of water, instead. “Take little sips,” I told him. He seemed okay, in good spirits and talking. Later on, I took him to the bathroom to use the potty and get dressed, and as I was taking his shirt off, he looked…off. “What’s the matter, buddy?” I asked him. Then he made that face…you know, the face kids make when they’re about to puke. By some miracle, I managed to whirl him around to face the toilet and he was sick in the bowl. I was glad I hadn’t let him have any milk. Poor guy…it had been a long time since he was sick to his stomach. The last time he had a stomach flu he was just 14 months old. We still refer to that illness in our household as “The Great Stomach Flu of 2011” and Graham and I had both had to miss work that week to care for our very sick boy and recover from the sleep deprivation that followed. After he was sick, I sent a text to Nate’s daycare provider to tell her we’d be staying home that day and I got him settled back on the couch with a blanket, a bowl and a movie. I rolled up the area rug and put it away for the day, the result of a lesson learned during that awful flu two years ago. I then checked my calendar to see what I had scheduled for the day. Fortunately I had no appointments, sales calls or important errands scheduled but I had been planning to continue a freelance editing job I’ve been working on. It was very easy to put that off for the day and instead focus on taking care of Nate. That day is the day I really understood the biggest benefit to being a self-employed parent. There was no manager or supervisor to call, no office I had to phone to notify I’d be off, no lost wages and no guilt. I could simply put aside work activities until Nate’s nap, later that evening, or the next day, even. At that moment I knew for sure that the decisions I’ve been making for my family and my work have been the right ones for us! I’m in the middle of a transition with respect to the way I spend my days and earn my income. I’m not sure what label applies to me; am I a stay-at-home mom or am I a work-at-home mom? Is it even important to make the distinction? It used to be so clear. I worked full-time as an editor at a publishing company that allowed me to work from home. When I had a baby, being a mother who worked full-time in a salaried position in a home office made me a work-at-home mom. Later, I left that job to work part-time at the local college as an instructor while Nate was looked after by a grandparent or at daycare. The line was clear: I was a working mom. Now, I’m leaving the college position to stay home and work two home-based businesses and do some freelance editing and writing. What can I say…I’m a woman who wears many different hats! I’ll be working for myself, in our home, while our son is looked after at daycare. And in the middle of all of this change, I’m finding it difficult to categorize myself as either a stay-at-home mom or a work-at-home mom. I was assured this scenario referred to WAHMs rather than SAHMs. Ever since our exchange, I’ve been thinking about the WAHM and SAHM labels, and I’ve decided that neither of them really feels natural to me. Neither really applies. We are so anxious to use labels to categorize one another, and I don’t feel like I fit into either one of these narrow categories. Instead, I’ll focus on the descriptors that Jen so helpfully offered in her tweets to me. Do you refer to yourself as a SAHM or WAHM? How so?